The third section covers examination in specific situations and emphasises an integrated and structured approach to these patients. A final section spells out how to demonstrate the techniques learned in the book in an OSCE. Macleod’s is closely linked to its sister publication, Davidson’s Principles & Practice of Medicine, which complements the information in this text. 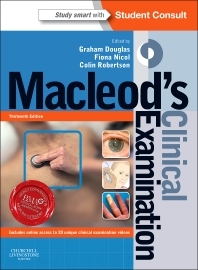 Available with full online access on Student Consult and ancillary videos demonstrating key clinical examination routines following the format laid out in the book. "While aimed at medical students, it is a useful resource for nursing students, experienced nurses returning to clinical practice and the wider healthcare team."